The technology incorporated in the Hazelett twin-belt bar casting machine has evolved over decades of innovative engineering and design in our shops and in those of our partners where casting trials are conducted. Each new caster incorporates the latest mechanical, electrical, and process improvements and delivers ever-increasing production volumes and product quality. To accommodate casting speeds of 13 meters (42 feet) per minute or more and accurately control metal flow rates of up to 60 tonnes per hour. Hazelett uses a radar sensor to measure the copper level in the launder, which when casting in "automatic mode" can keep the metal level in the launder within +/- 3 mm. An electromagnetic metal level indicator (EMLI®) system is used to sense the pool level in the caster. A proportional signal is provided, which actuates the stopper rod to control metal flow from the lower launder into the tundish. Casting speed is held constant and the caster can be run in a completely automatic mode. The caster pool level can be held within +/- 2 cm along the belt using the EMLI system, which is a significant improvement compared to manual or optical control. The side dam blocks form a major part of the bar caster mold surface, thus they are made from high-conductivity alloys. The blocks are mechanically interconnected in the unique Hazelok design to ensure an even, smooth mold surface. The Hazelett® twin-belt caster is unique among moving mold casters in that all four mold surfaces are independent. This allows the mold surfaces to be tapered to remain in contact with the cast product as it shrinks. The high-velocity, fast-film cooling water, which is continuously applied to the backside of the belt, impinges the belt at a slight angle, creating a force on the belt. This force acts to press the belt against the surface of the strip or slab as it shrinks, keeping the belt in intimate contact with the product throughout the mold. When casting thick slab or copper bar, the belts can be tapered by progressively shaping the belt down the length of the mold. This is accomplished by either increasing the diameter of the back-up roll fins in the casting region or tapering the upper carriage and decreasing the diameter of the fins in the side dam block region. The sides of the mold are tapered using spring-loaded guides that keep the blocks in contact with the bar. An optional tundish tip preheater that has auto-ignition and the power for fast preheating can be quickly installed and retracted prior to pouring. Compliant dam block entry guides maintain proper alignment of the dam blocks as they enter the moving mold. The guides offer improved cast bar width dimensional control, better dam block temperature control, a more stable metal pool, and higher casting productivity. A water-graphite mixture is sprayed on the dam blocks in a small amount with an accurate, optimized, and reliable pump system to help with the mold release. Oil can be applied to the casting belts to improve both belt performance and product quality. The Hazelube system offers improved reliability, an optimized spray pattern, and minimal overspray. The automatic dam block tension system utilizes hydraulic cylinders and proportional valves to independently vary the dam block backbreaker roll positions for consistent dam block chain tension. 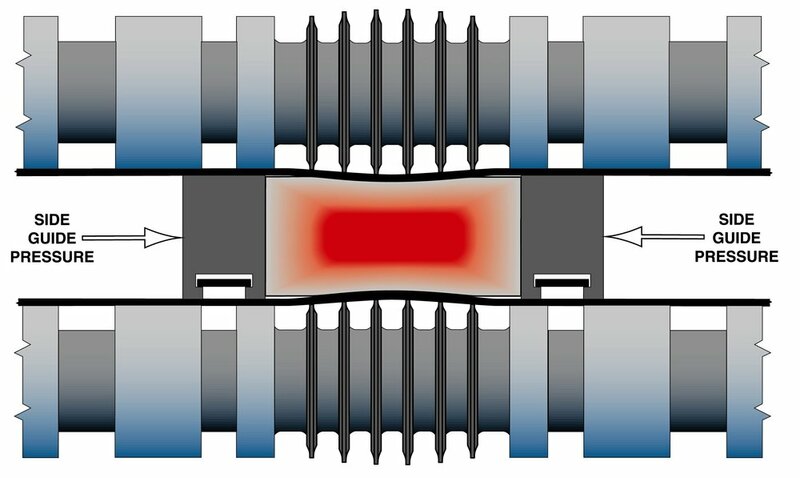 This system decouples the relationship between dam block chain tension and temperature so that the ideal chain temperature and the ideal chain tension can each be maintained during casting.